Automatication is your virtual development team who creates add-ons and automated solutions for the Adobe Creative Suite. Automatication find solutions where you may think there aren't any. Repetitive or complicated tasks you perform can be analyzed and turned into a single click action by our team - Contact Us if you need to boost your productivity, efficiency and effectiveness. 29/10/2018 - UPDATE - Multi-Find/Change 3.0.2 is fully compatible with Adobe InDesign CC 2019. 18/11/2017 - UPDATE - New release of Multi-Find/Change 3.0.2 for Adobe InDesign CC 2017 & 2018. Bug fixes. 18/10/2017 - UPDATE - New release of Multi-Find/Change 3.0.1 for Adobe InDesign CC 2017 & 2018. Bug fixes and support for InDesign & InCopy CC 2018. 10/1/2017 - UPDATE - New release of Multi-Find/Change 3.0 for Adobe InDesign CC 2017. 20/12/2016 - UPDATE - We will be releasing Muti-Find/Change 3.0 for Adobe InDesign and InCopy CC 2017 the 9th of January 2017. 23/11/2014 - UPDATE - New release of Object States Assistant 1.0.5 for Adobe InDesign. Provides compatibility for Adobe InDesign CC 2015. 05/10/2014 - UPDATE - New release of Multi-Find/Change 2.0.4 for Adobe InDesign. Provides compatibility for Adobe InDesign CC 2015. 01/07/2014 - UPDATE - New release of LayoutZone 13b5 for Adobe InDesign CS5, CS6, CC & CC 2014. Provides compatibility for Adobe InDesign CC 2014. 01/07/2014 - UPDATE - Release of Object States Assistant 1.0.4 for Adobe InDesign CC & CC 2014. Provides compatibility for Adobe InDesign CC 2014. 28/04/2014 - UPDATE - Release of Multi-Find/Change 2.0.3 for Adobe InDesign/InCopy CS6, CC & CC 2014. Provides compatibility for Adobe InDesign CC 2014. 28/04/2014 - UPDATE - Release of Object States Assistant 1.0.3 for Adobe InDesign CC. Fixes a problem related to copying text in modal dialog. 28/04/2014 - UPDATE - Release of Object States Assistant 1.0.2 for Adobe InDesign CC. This version fixes issues related licensing. 25/04/2014 - UPDATE - Release of Multi-Find/Change 2.0.2 for Adobe InDesign/InCopy CS6 & CC. This version fixes issues related to Change Case and Object queries. 11/03/2014 - NEW RELEASE! - Happy to announce the released of Object States Assistant 1.0 for Adobe InDesign CC. Object States Assistant (OSA) adds new functionalities to multi-state objects and improves the multi-state objects user experience. OSA improves states navigation, it also allows you to add objects to specific states, as well as remove and release multiple states in a single operation. 28/10/2013 - NEW RELEASE! - Automatication is proud to announce the release of Multi-Find/Change 2.0.1 for Adobe InDesign/InCopy CS6 & CC. This version provides compatibility with Adobe InDesign/InCopy CS6. Multi-Find/Change panel is now a native InDesign (InCopy) panel, this means it can be docked, minimized or expanded. Multi-Find/Change is compatible with the themes of the new InDesign (InCopy) CC interface. Perform Find/Change on Paragraph and Characater Styles. Associate a pair of "Find What"/"Change To" list of strings or grep expressions to a (Text or GREP) query. Quickly edit the query "Find What" and "Change To" fields. Have the option to delete page items with Object queries. 23/04/2012 - NEWS - The current versions of Find/Change Attributes and Multi-Find/Change are compatible with Adobe InDesign CS6. Owners of these products can intall them in Adobe InDesign CS6 and continue to use their existing serial numbers. 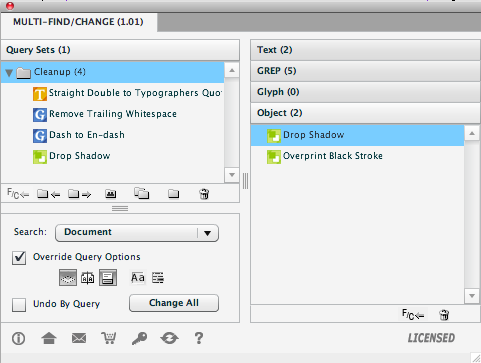 14/03/2012 - NEW REALEASE - Find/Change Attributes for Adobe InDesign CS5/CS5.5. Find/Change Attributes enables you to load formatting attributes from selected text ino the Find/Change dialog. 1/03/2012 - NEW - New release of LayoutZone 13b3 for Adobe InDesign CS4/CS5/CS5.5. Maintenance update. 15/02/2012 - NEW - New release of LayoutZon3 1.3b2 for Adobe InDesign CS4/CS5/CS5.5. Export selection now supports PNG, Interactive PDF and HTML. Keyboard Shortcuts dialog has now a LayoutZone product area. 08/05/2011 - NEW RELEASE! - Multi-Find/Change 1.02 for Adobe InDesign and InCopy is now available. FREE UPDATE! This version provides compatibility with CS5.5, as well as some new features. Multi-Find/Change 1.02 can now convert Find/Change query results to UPPERCASE, lowercase and Title Case. Executes shared sub-sets. Imports and exports loose Find/Change queries. 04/05/2011 - NEWS - Multi-Find/Change for Adobe InDesign and InCopy CS5.5 will be released the 9th of May 2011. Stay tuned! 28/02/2011 - HELP - Christchurch Earthquake Appeal. Help New Zealand rebuild ChristChurch. Online donations redcross.org.nz/donate. The Applescripts were migrated from CS1 to CS3 and included several thousand lines of Find/Change code - much of which probably wasn't in use anymore. The scripts included features such as superscript $, superscript .00, remove bullet points, change soft returns to hard returns, apply stylesheets on some find condition etc. "When we moved the agency to Adobe InDesign CS5, rather than try to migrate the Applescripts, we investigated using Automatication's Multi-Find/Change (MFC). We needed a fast, easy to maintain system which could be deployed on a network with a single point of update. One of the little known features of MFC is the "share" feature which enabled us to provide the client with a single "sets file" shared to all the desktop Macs. When the sets file is updated on the server, MFC displays a "needs update" icon in its interface and one click updates to the new sets. One last thing which impressed us was the performance. Using the Applescripts, a complex 32 page mailer would take 40-60 minutes to run the cleanup scripts. When we used MFC, the same cleanup operation ran in less than 5 minutes. We recommend MFC to any serious InDesign user - and publishing integrators similar to Digital Arena need to evaluate it for site installations using the share feature!" 31/08/2010 - FREE! New Predefined Set for Multi-Find/Change. Created by Laurent Tournier from indigrep.com, this new set cleans-up text, based on the French typographic rules. 24/08/2010 - FREE! Predefined Sets and Queries for Multi-Find/Change. 17/08/2010 - New release of LayoutZone. This version is now compatible with Adobe InDesign CS5. 17/08/2010 - Multi-Find/Change receives 4.5 out of 5 Butterflies from InDesign Magazine. 10/08/2010 - NEW RELEASE! - Multi-Find/Change for InDesign and InCopy, the new productivity tool that allows you to manage and share custom Find/Change queries. Multi-Find/Change executes multiple Find/Change queries at a click of a button. 13/04/2010 - ANNOUNCEMENT - Multi-Find/Change for InDesign soon to be released. Check out Multi-Find/Change features presented by InDesign expert Tim Cole. 23/12/2009 - New release of LayoutZone for CS4. This version improves Convert Zone reliability. 3/07/2009 - New release of LayoutZone for CS4. Bug fix, reinstates correctly the application measurement units. 10/06/2009 - NEW! PlaySWF for CS4 Add-On. Now you can preview placed SWF files or even play any SWF within InDesign. Great tool if you are creating interactive PDFs from InDesign. 7/06/2009 - Released new version of LayoutZone for CS4. Commands Assign Zone and Convert Zone now support Undo. 11/04/2009 - LayoutZone gets runner-up in the FREE Third-Party InDesign Script Category at the InDesignSecrets.com Awards. 05/04/2009 - LayoutZone for Adobe InDesign CS4 has been released.